Here at Hidden Hollow Beads we offer a wide variety of supplies for your cancer awareness fundraising needs. Whether you are raising money for cancer research or to donate to a friend, family, or community member, we recognize that you are making a sacrifice of time and effort to help someone else defeat cancer. We offer several ways to help you keep more of the money you raise. First, we offer cancer awareness fundraising supplies in a kit that allows you to assemble your own cancer awareness jewelry. This keeps the overall cost very low, and allows you to keep more of the profits to donate to cancer causes. Secondly, we offer a 15% discount for purchases that will be used to raise money that will be donated to cancer causes. We make it as easy as possible to qualify for the discount, please see our Cancer Awareness Policy Page for more details. 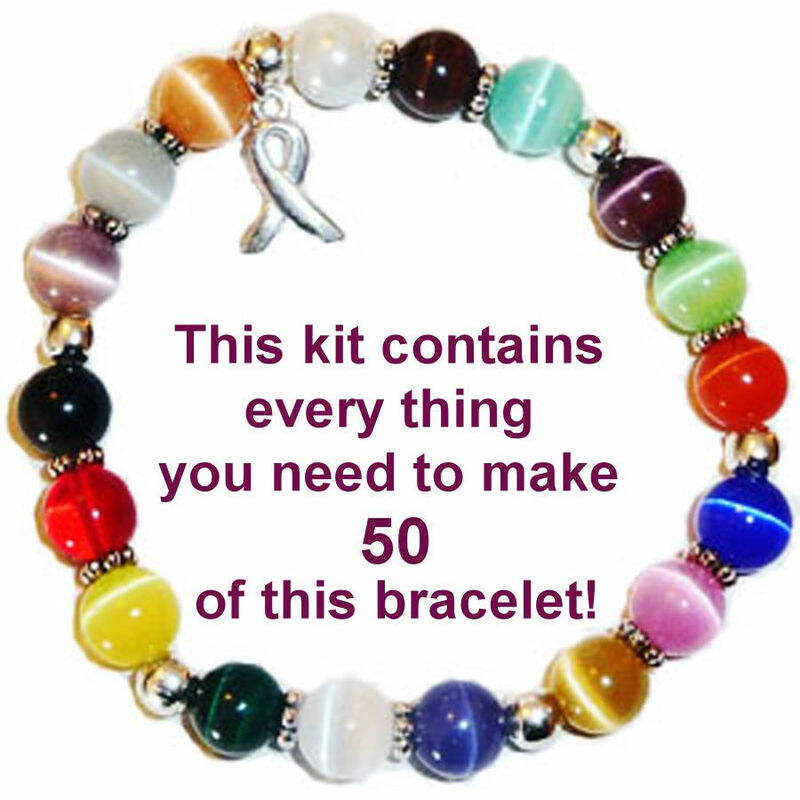 Cancer Awareness Kit – Everything you need to make 50 8mm bracelets. 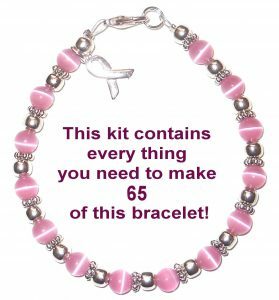 Breast Cancer Awareness Kit – Everything you need to make 65 bracelets in 6mm cat’s eye beads. Breast cancer is a devastating disease and can leave it’s victims feeling defeated and beat down. When you step in to help raise money for medical bills, child care, travel funds, or anything else that might be needed, you want to make sure you get the most return for your time and energy investment. Buying your cancer awareness fundraising supplies in a kit, that you can assemble with friends or volunteers, allows you to make more money, and save more money, giving you more to donate. And in the end, having more to donate really is the bottom line. This kit has everything you need to make 65 beautiful cancer awareness bracelets from start to finish. The bracelets come out to be 1.46 each with this kit. They can be sold for 6.00 to 10.00 each, or you may decide to accept a donation for the bracelets. Some people have very good luck asking for donations, as opposed to asking a specific price. For help in planning your cancer awareness event, please see our planning page. Breast Cancer Awareness Kit comes with a picture of the completed bracelet so that you have a pattern to follow. These breast cancer awareness bracelets are fun to make with a group of friends or volunteers. Finished bracelet is about 7 3/4 inches long, this fits almost all adult wrists and the wire makes it very strong. Following is a list of everything included in the kit: (Please note that this kit does NOT include a jewelry tool. If you do not own one you will need to purchase one to work with the crimps and the clasps.) 14 Strands 6mm Pink Cats eye beads 70 – Cancer Awareness Ribbon Charms Silver Plated 1,000 – 5mm Silver Plated Beads 1,000 – 5mm Silver Plated Bali Daisy Spacer Beads 75- 12mm Silver Plated Clasps 200 – 2x1mm Silver Plated Crimps 100 – 6mm Silver Plated Split Rings 1- Spool of 7 Strand Beadalon wire 100 Ft.